Is SCORPION Beginning To Jump The Shark? I've been enjoying the CBS series called Scorpion. It is about a team of geniuses that have been assembled by Homeland Security. They tackle the cases with the sheer level of intellect, thinking their way through and out of things as cases develop. 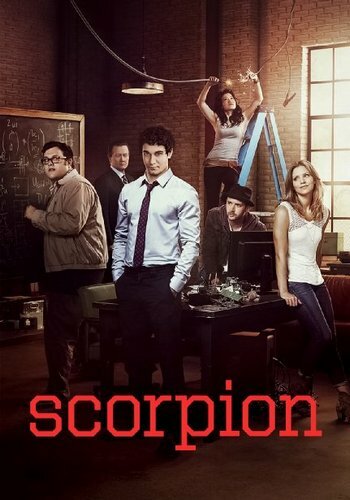 The series is created for TV by Nick Santora (Vegas, Breakout Kings, Lie to Me, Prison Break) and stars Eddie Kaye Thomas, Jadyn Wong, Ari Stidham, Elyes Gabel, Kathraine McPhee, Robert Patrick and Rily B. Smith. I'd say it's an hour of a bit of fun and I like the characters but of late, I believe the show has found "the shark!" A few weeks back the team had to address an issue with a dam. And apparently this dam should have been drained and shut down long ago because once the team got on site, just about everything that could go wrong with a damn, did go wrong. To be honest, the show can be fun, it is starting to feel like it is beginning to jump the shark and getting desperate for stories. I hope these eps are just moments... but if this keeps up, this show is getting pulled from my DVR. Agreed! The show is becoming too full of cliche's. They also keep repeating the same discussions over and over again about their quirks. As you mentioned, the constant situations where everything that can go wrong goes wrong. The show itself is already unrealistic, like most shows, but you can only suspend reality to a certain point when it comes to a show like this. Happy Quinn is just flat out annoying on every level possible... it's like they deliberately called her Happy in order to create the ultimate irony since she is constantly the complete opposite of Happy. For being a bunch of geniuses with the ability to make money and accomplish amazing things, none of them are written to be even remotely happy at all. They are all dreary conflicted people who don't seem at all happy about life in general. Just doesn't make any sense at all. Everything is over analyzed and the fun sucked out of it. They need to button up the show, make it more serious and less comedic. The comedy aspect is overpowered and not very well done anymore. Give them lives beyond the team, just don't overpower that aspect. And for piss sakes... give them some happiness. Hey Moto... yea, I don't see them buttoning anything up. Then again, I removed it from my DVR timer, so I could not attest to any buttoning! Love your comment and your spin on things!